What young girl wouldn't love an advent that turns into jewelry? 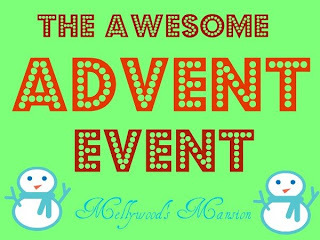 Today marks the beginning of The Awesome Advent Event. Each day I will be sharing an advent suitable for for every age - mainly because I have them all ages in my house. The jewelry pictured above begins as an advent that looks like this. First mix equal parts of glitter and modpodge, I recommend starting with a small amount as a little goes a long way, and paint the bottle caps. While they're drying mark out the placement of the bottle caps on your frame back and screw the hooks in to make the holes. Once you have made all of the holes paint the frame back with the glitter and modpodge mix, once dry add another coat of modpodge to seal and dry. Punch 25 1 inch circles from your scrap book paper and modpodge to the other side of the bottle cap. I choose not to go with a Christmas theme so my daughter can wear her jewelry after the Christmas holidays. Then add the epoxy dots. These magnify the pictures and really make them pop. Add your findings - what you use will depend on the jewelry you would like to make. I made charms to make 3 pairs of earrings, 2 bracelets, 2 necklaces and 2 key tags. Then I made a little pillow box to place the finding in, your little girl can decide what jewelry she would like to make each day, you could also buy a little gift box if you wanted to. Then I decorated the frame and called it done. Each day help them add a charm to the various findings and by Christmas Day your little girl will have quite the jewelry collection. I think a pretty little jewelry box for Christmas will complete this. 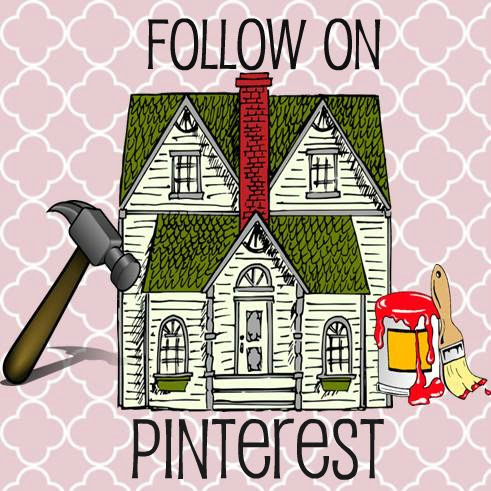 DIY Delight or Disaster? Well Elizabeth has asked me every day since I finished it when it's time to start the count down so I'm going with delight! Come back tomorrow for my crazy quick baby advent. 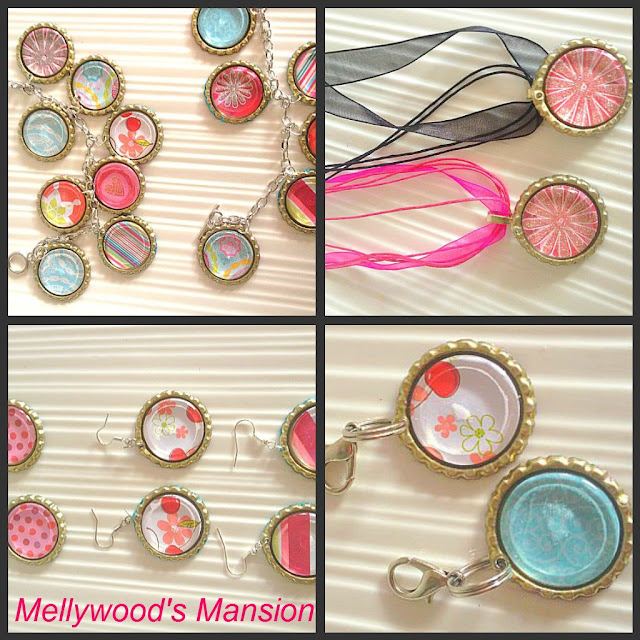 Be Delighted Every Day, Follow Mellywood's Mansion! This is brilliant. What a cool and unique concept. I can't wait to see what else you have to share. I know a little girl (and a big girl) that would love this!!! I love this idea, I have never seen an advent like this. You are so clever! I loved this when you posted it at Sugar Bee! 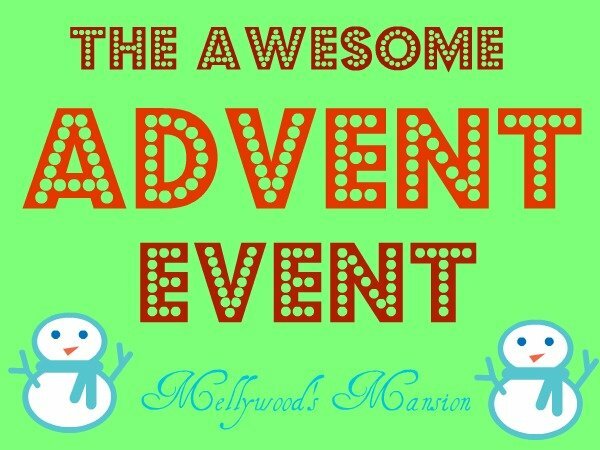 I totally love the idea of the Awesome Advent Event! You so rock girl! I totally love this idea... Is so cute!!! This is gorgeous! What a cool idea! I like the ribbon necklaces. Thank you for linking up to Raising Imperfection this week with your favorite post. 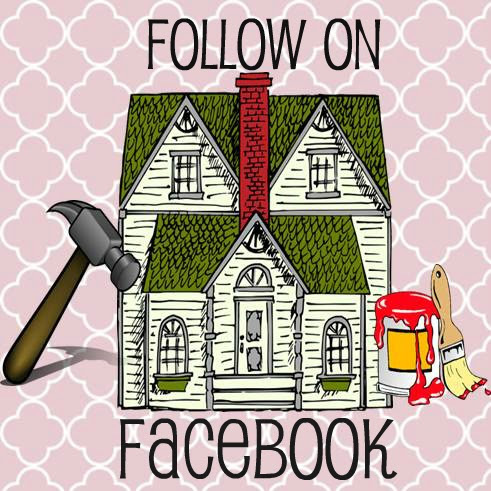 Please come back Friday to see if you were featured! I've never ever seen such a thing. Those turn out really great, I like them quite a bit!! Visiting today from the Raising Imperfection hop. So cute and creative!!! I love them! These are so beautiful! Very clever! 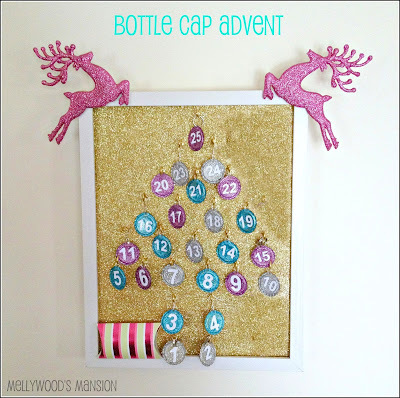 What a fun and unique advent calendar. Love the necklaces with the ribbon! Awesome. This is such a great idea, I'm sure your daughter will remember this one forever, so fun! What a great idea for a little girl! These are sooo stinking adorable! Thanks so much for sharing with the Pink Hippo Party.. I am your newest follower! This is such a great idea - thanks for sharing! And thanks for stopping by my blog and leaving a sweet comment :) I am now following you and I look forward to future visits. Have a lovely week! I love it! I just featured you as today's Dare to Share Feature of the Day. This is such a cool idea and i know my 11 year old would love to have one. You're AMAZING Mel!!! What a GENIUS idea!! My little ladies would love an advent calendar like that! CONGRATS MEL! You were featured today at Raising Reagan!! What pretty jewellery, must have a go. Thanks for sharing. I love these. The earrings and necklace with the ribbon are my favorite! Thanks so much for linking these up at Think Tank Thursday. See you tomorrow night! what a great bottle cap upcycle! thank you for linking this too! what a great and unique take on the advent calendar! That is such a sweet way to count down the days to Christmas! I only have boys, so maybe a lego one would do...but next year! UGH. Not happening now!!! What a cute idea! I found you at the CSI Project advent calendar linky. Happy Holidays! Love this! 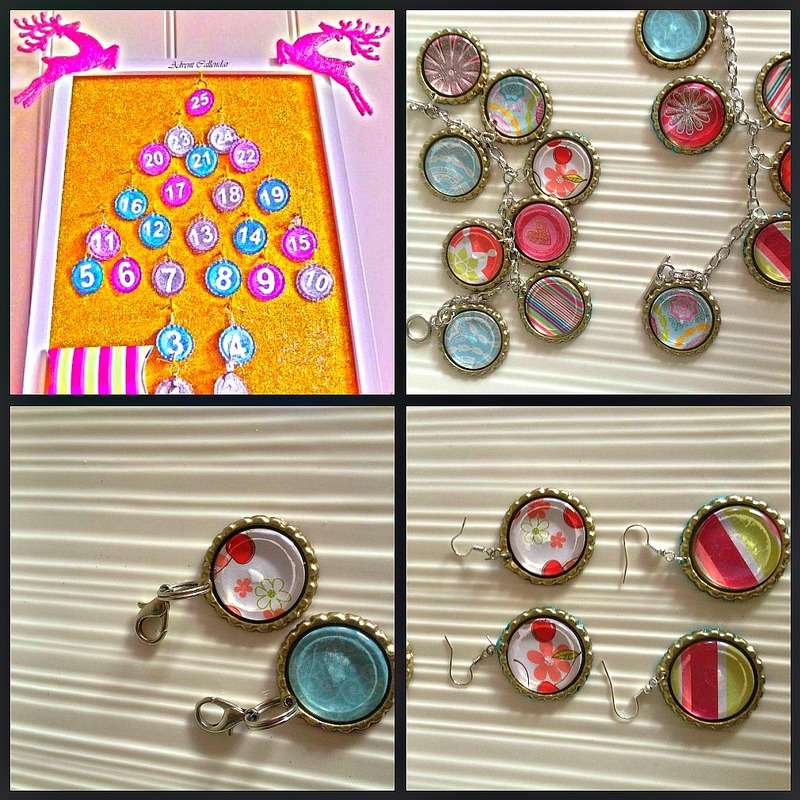 So creative and a fun way to make jewelry! The epoxy dots are so much fun to work with, I found! Oh my goodness, that's genius!! What big girl wouldn't love that too, lol? Thanks for entering One Crafty Contest; good luck! I hope you win! You have my vote. A Kindle Advent - A Readers Dream! Australia - The Best Country in the World! Oh Boy - The Votes Are In !